The "entrepreneurial classic": A business owner's bible for start-ups and professionals alike—now completely revised and updated (CNBC). Written in clear, easy-to-understand language, Inc. Yourself is a no-nonsense, step-by-step guide to creating your own success story. 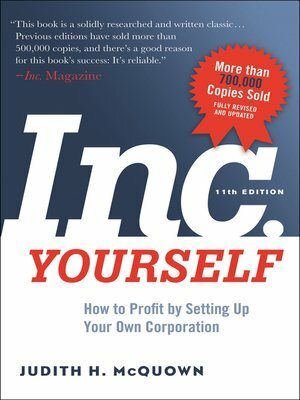 And it's not only for start-up entrepreneurs; it also speaks to long-time professionals, downsized executives, women and minorities frustrated by the limits of the glass ceiling, work-at-home moms and dads, enterprising students, retirees who want to protect their assets, and anyone who's ever asked, "How can I profit from doing what I like to do?" Featuring state requirements for general businesses, sample minutes and bylaws, quizzes, charts, checklists, and sample tax returns, Inc. Yourself provides every conceivable piece of information and guidance you need to take charge of your career and secure a profitable future. This how-to guide has stayed in print for decades and sold nearly three-quarters of a million copies for a good reason: It works. And now, more than ever, it's essential.